Centaur Creature Avatar with Motions for Fantasy Movie! 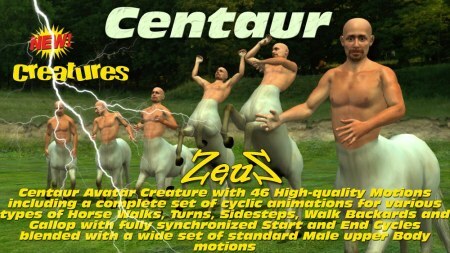 Description: This Pack contains one Male Centaur Avatar plus 46 high quality Male Centaur Motion files. The Centaur It is presented as a non-human .iAvatar with embedded animal persona. When animating the character, you can either drag and drop the supplied animations directly on the character or right click on the character and select the Performance directly accessible from the Performance pull down menu. The Pack includes a complete set of cyclic animations for various types of Horse Walks, Turns, Sidesteps, Walk Backwards and Gallop including fully synchronized Start and End Cycles all blended with a wide set of standard Male upper Body motions. The Jaw and Eyes have their respective bones and can be fully animated. Ideal for Medieval and Fantasy Movies. Muchas gracias por la aportacion Zeus.